Copy color value (HEX or RGB) to clipboard? Is there a way to copy a color value of an object to the clipboard for pasting in an CSS file, for example? I need to apply various RGBA values (RGB with alpha/transparency) and am tired of manually typing them for every object. OK, I just found the dropdown in the color panel where you can copy the currently selected color value as HEX. That might be useful sometimes but doesn’t help me in this case. Firstly, I need RGB(A), and secondly the color is applied as color overlay effect, not as standard background color. So, I wish I could just open any color panel and there would be a similar menu as in the color panel to copy a value in different variants. 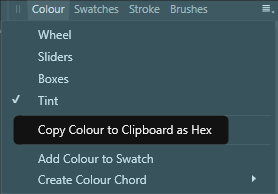 I would love a feature that would allow you to copy not just the hex, but the cmyk, rgb or other color value to the clip board or let you export them as a simple text file. Bonus points for allowing you copy export other css values (ex.  svg, css value to make a circle or logo).